Because of our recent commitment to lower carb eating, I'm always on the lookout for recipes that won't suffer from substitution. 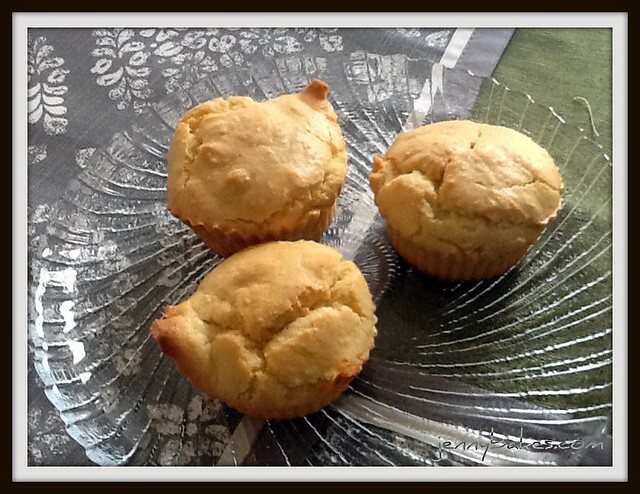 Take these almond baby cakes from Dorie Greenspan - naturally gluten-free, since so many French baked goods are made of almond flour instead of wheat to begin with (according to her). After not finding great results baking with Splenda, the taste being too evident, I decided to experiment next with Stevia. Stevia is naturally occurring, in a shrub from the daisy family. The blend I used is similar to the Splenda for baking - somewhat powdery so you can use it cup for cup in a recipe. I wish I could impart to you that this is the answer! That Stevia tastes like sugar! That this is the easy solution to make all your baked goods lower carb! Oh how I wish that could be true. I found this to have just as bad of a taste as Splenda, if not worse. While the Splenda cheesecake seemed to mellow after a few days in the fridge, these were better warm. I tried one cold this morning and had to just toss it. The chef at the alternative baking class did say we could also just reduce the amount of sugar in a recipe; that may be what I'll have to try next, although I'm not sure it will sufficiently cut back on carbs enough for me. Agave nectar may be another thing to try, but I'm getting mixed information on that ingredient. The Wheat Belly guys and low-carbers say not to use it, but the Glycemic Index people say it is okay. The Wheat Belly guys actually said it is worse than sugar because it is higher in fructose than sugar is. I don't understand enough about the chemistry behind any of it. In the past, I never used to blog something and urge you not to make it. I just thought my experimentation might teach my readers something too. I don't believe the original Dorie Greenspan recipe to be flawed, and if you were looking for a gluten-free treat that didn't need to be low-carb or low-sugar, I'd try the original recipe as written. Ground almonds make a nice toothsome, slightly crunchy texture to things, and add a lot of flavor. The way the ingredients are blended together, there is nice volume and lightness to these baby cakes. thanks for this post. I now have a view on how stevia tastes.